Downloading spam to your email client and then deleting it is inefficient. It wastes server space, time and bandwidth. Far better is to never deliver spam to your mailbox. Servers at Pair Networks have spamassasin, which helps identify spam. 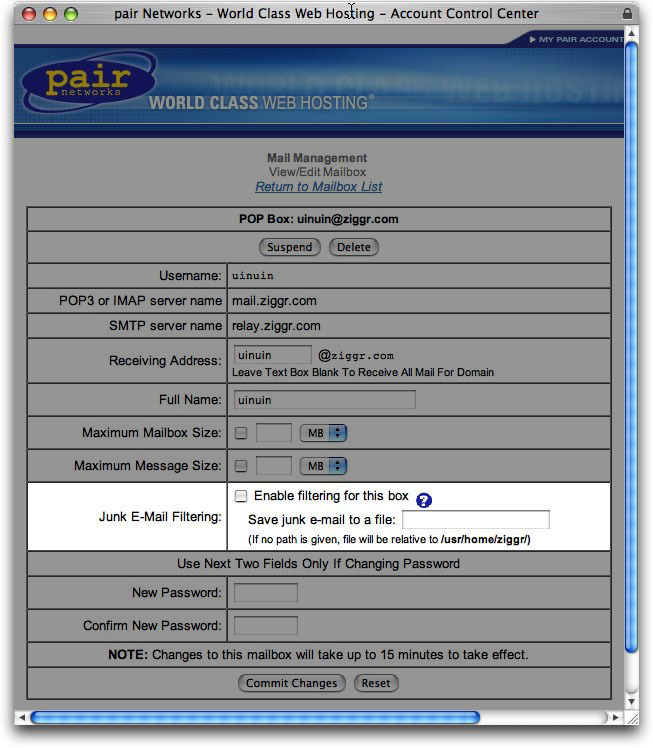 Servers at Pair Networks also have procmail, which help route and act on mail based on some filters. Using the two together to block delivery of spam requires a bit of understanding of how mail works at Pair, and a short procmail script. spamassassin score 5.0+: obvious spam. Quietly delete this mail, I don't want to even know about it. spamassassin score 2.0-5.0: probably spam, but some wanted mail. Store this in a grey area mailbox, so I can sift through it manually. spamassassin score 2.0-: wanted mail. Send this on through to my mailbox. one script needs to work for all the email accounts on my domain. 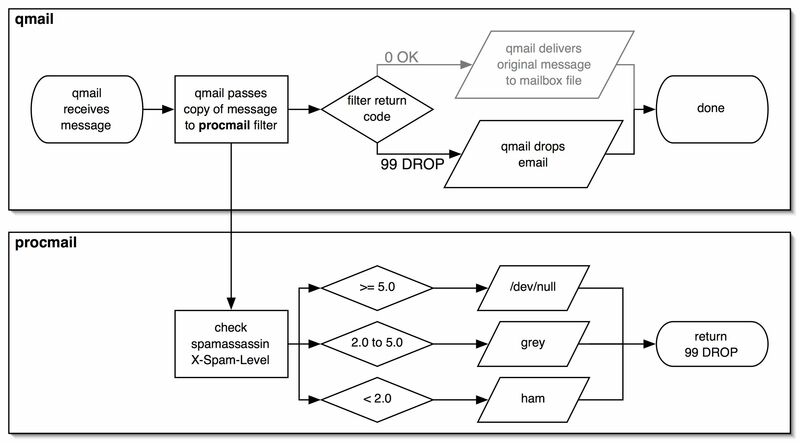 keep spam and ham mailbox files on the server so that I can use them to retrain spamassassin’s Bayesian filters. 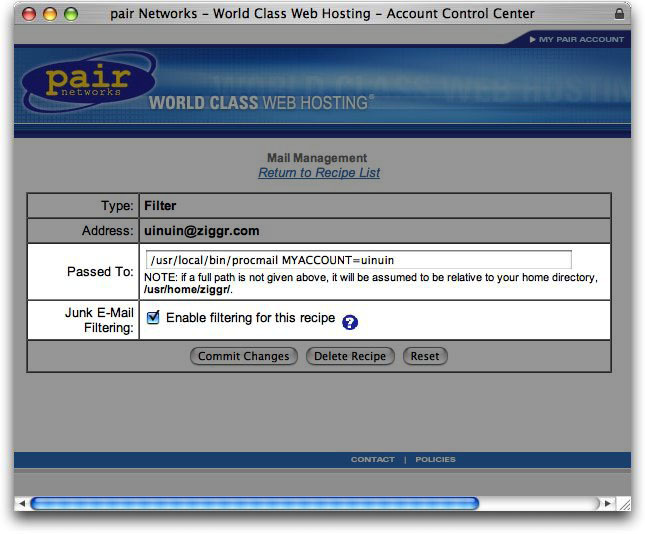 Turn off in Junk E-Mail Filtering for the mailbox in the Pair Account Control Center for the mailbox. Yes, I said off. You will turn it on elsewhere, in a recipe. 2. Create a Filter recipe for the mailbox. MYACCOUNT=uinuin sets a variable that I use in my procmail script. This variable controls the directory where the procmail delivers mail. This lets me use the same script for all my domain’s email accounts. The MAILBOX part is automatically generated for every mailbox, and is not part of the filter rule. Initialize the mailbox files where your messages will eventually land. In your email client, create IMAP folders grey and ham. Although I am not positive this step is required, I fear that if you skip this step, and procmail creates these files instead of your IMAP client, IMAP will become confused. IMAP on Pair Networks servers requires some special setup stuff at the top of each IMAP mailbox file. If you use POP3 for your main account (account@pair.com), your mailbox file is in your home directory, I think. Those first two lines (LOGFILE and VERBOSE) are just debugging hooks, you can comment them out (stick a # sign in front of them) once you are happy with everything. If you do not eventually comment out these lines, ~/.maillog will grow and grow, consuming your disk quota. While developing, I usually keep one shell window open with tail -f ~/.maillog running, so I can see as each email message comes in and gets routed. EXITCODE=99 tells qmail that we are going to take care of delivering each message, and that qmail does not need to deliver it to the mailbox. If we did not do this, qmail would see the default return code 0 (OK) and interpret that as the filter program said the email was acceptable, so now I should deliver it. This results in duplicate copies of all mail landing in your mailbox, as well as filtered spam/ham copies landing in spam/ham mailboxes. When a Pair Networks server delivers mail, it comes through qmail. qmail passes a copy of each original email message to each filter set up through the Account Control Center. If all filters return a result code of 0 OK, the message is passed through to the mailbox. If that mailbox has Junk E-Mail Filtering turned on, then it is passed through spamassassin before it goes to the mailbox. If any filter returns a result code of 99 DROP, qmail stops processing that message, qmail does not deliver the message. MYDIR=/usr/boxes/ziggr/ziggr.com/$MYACCOUNT^/.imap sets the parent directory that contains mailbox files grey and ham. If you use POP3 instead of IMAP, you will want to change this path, and you will need to keep separate POP3 mailboxes for grey and ham. This first filter looks for any message whose header contains a spamassassin score of 5.0 or greater (5 stars). These messages are routed to /dev/null and never heard from again. This second filter looks for any message whose header contains a spamassassin score of 2.0 to 4.9. These files are routed to the mailbox $MYDIR/grey, where they will sit until you manually sift through the mess. Note that the order of filters in procmail filters is significant. If you put the 2-star filter first, it would match before the 5-star filter, and all spam would land in the grey box, no spam would be automatically deleted. All remaining mail is sent to a ham mailbox. You might want to monitor ~/.maillog for a few days to see what email is being deleted and why, or tweak the number of stars in the ~/.procmailrc filters. Your Pair account stores its Bayesian data in /usr/boxes/your-pair-account/bayes/. This data is shared across all email accounts in your domain, so if your accounts have wildly diverging mail, you might not be able to use Bayesian filters as effectively as you would like. You do not have to share Bayesian filter data across all your email accounts. You could set up your own spamassassin configuration, but that is a bit more work than I was willing to do. PairUsers.com is a wiki database capturing a lot of helpful knowledge about being a Pair Networks customer. Not an official Pair Networks project, just a bunch of users helping out other users. RTFM, baby! I eventually had to break down and read the man pages on procmail. Mindlessly copying and pasting from other example scripts was not nearly as effective as spending a few minutes to learn what I was doing. Although I read the FAQ, I neither needed nor used anything I learned from the FAQ. My .procmailrc is just too simple. Pair Networks’ own support pages are pretty useless on this topic. Just a few light sentences telling how to turn on/off a checkbox. Nothing on combining the three tools qmail, spamassassin and procmail. The pair.mail newsgroup on Pair Networks’ support forums contains a vast wealth of data, dating back years.